Bee Line Cable has it all! 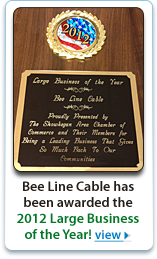 Bee Line Cable brings the finest communication services to our customers in central Maine. High Speed Internet, Digital Phone, Digital Cable – Bee Line Cable provides everything you need to stay connected to your world. We’re a local company, your neighbors, and we’re proud of our friendly, courteous service and our state of the art fiber network that always delivers the clearest signal for your family’s communication and entertainment needs. With Bee Line Cable, you get it all.